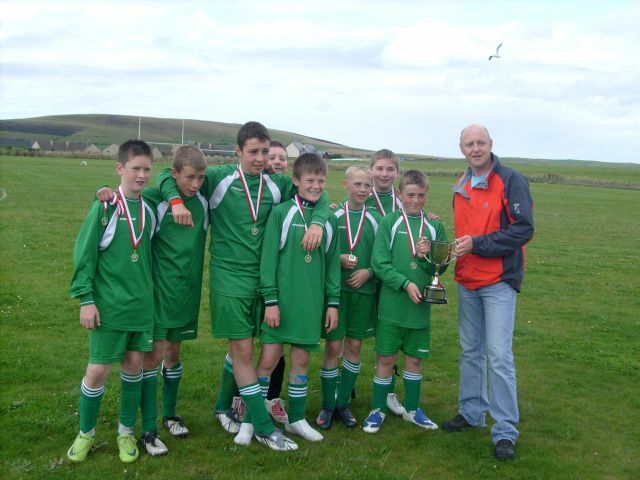 (Above) Thorfinn A - Winners of R Clouston Cup 2009 with Andy Smith who presented the trophy on behalf of the sponsor. 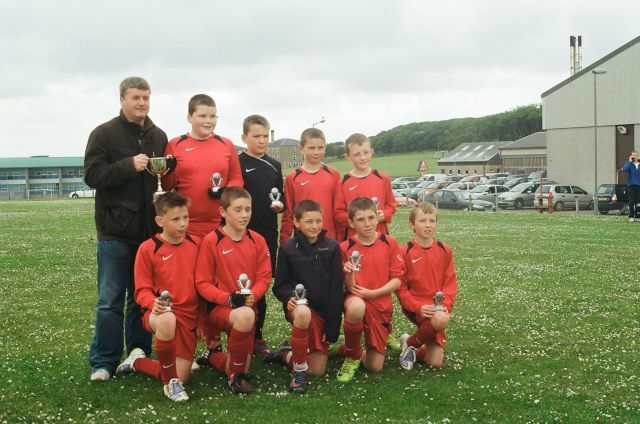 The 2009 S1 & Under outdoor season concluded on Saturday 15 August with the two knockout cup competitions being completed in favourable conditions at Dounby. In the main competition the R Clouston Cup, the two best teams Thorfinn A and East United A met in the final after negotiating the early rounds in convincing fashion. Despite competing bravely the young East United team were beaten 3-1 by the older and stronger Kirkwall team whose victory secured them a league and cup double in a very successful season. Despite their defeat the future looks bright for East United and they will be expected to be highly successful in future S1 & Under competitions. There was success however for East United in the R Clouston Plate when their B team won what was a more closely fought and less predictable tournament than the Cup. 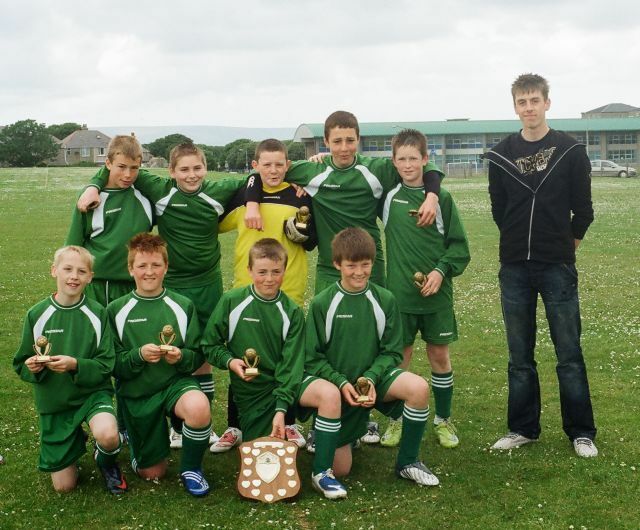 In the final they played Dounby B, both teams having narrowly won their semi-finals. Whilst having the majority of the play East United B were unable to penetrate a determined Dounby defence and the game finished scoreless. East United edged a thrilling penalty shoot-out which brought an excellent days competition to an end (scroll down page for East Utd B team photo). At the presentation ceremony Jim Cormack OYDG Chairman thanked all those who had assisted in organising the competitions and introduced Andy Smith representing the sponsors who presented the two winning teams with their trophies and medals. OYDG would like to thank R Clouston Ltd for their continued sponsorship of the knockout cup competitions. 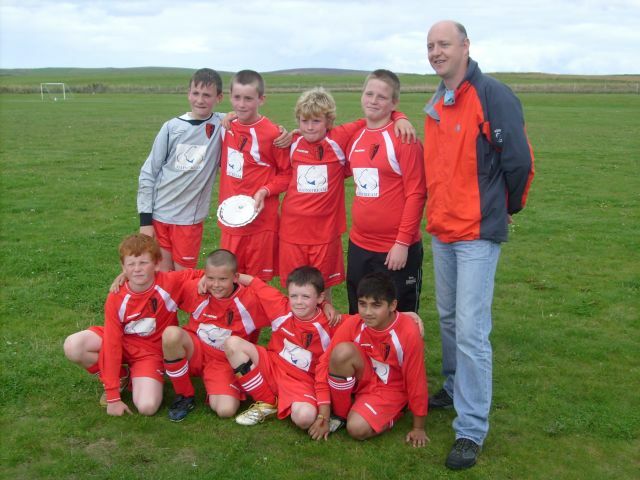 (Above) East United B - Winners of R Clouston Plate 2009 with Andy Smith who presented the trophy on behalf of the sponsor. 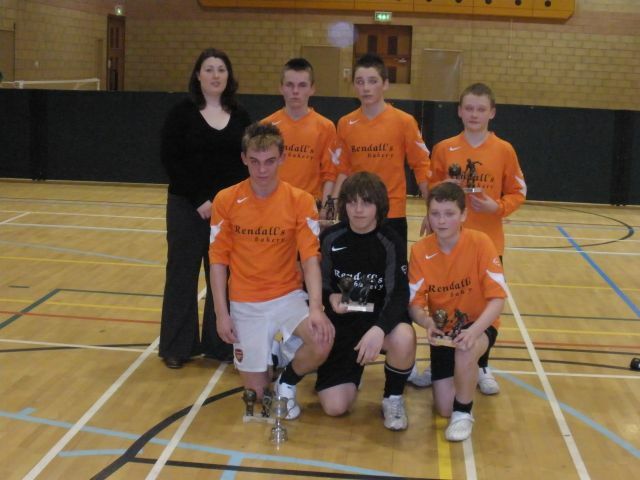 (Above) Thorfinn A - Winners of E G Kemp Shield 2009 with Eric Kemp who presented the trophy on behalf of the sponsor. Fixtures for the EG Kemp Shield (Division 1) and the BW Kemp Cup (Division 2) were concluded at KGS on Saturday 20th June. The B W Kemp 2nd Division was won quite easily by a very good East United A team with a 100% record & not even a goal conceded over 12 games. It makes the future for East United in only their second season look very good. The E G Kemp Division 1 was a bit more competitive with Thorfinn A coming out deserved winners at the end by 8 points from a good Stromness A team. This could have been a bit closer had it not been for the day in Finstown when Stromness short of players got two very creditable draws when with a full team they would have probably taken full points. The B W Kemp Cup was presented to East United by Paul Kemp & the E G Kemp Shield to ThorfinnA by Eric's grandson Eric. OYDG would like to thank Eric Kemp & Ruth Kemp & her family for their continued support of the S1 & Under Leagues. After a very competitive night's football Group A was won by Thorfinn A with Thorfinn B in second place. Group B went to Rovers A with Thorfinn C in second place. Thorfinn A & Rovers A went through to the final, a repeat of last week's S/3 S/4 final. A very strong Rovers A team won a tight final by 3 goals to 2. Jim Cormack Chairman OYDG then gathered everybody together and first thanked Stromness & East United for the refereeing, scoring & timekeeping on the night and the Picky staff for their usual efficiency. He then went on to thank W Hourston Jeweller for their continued very generous sponsorship of the Indoor 4s. Candice Shearer on behalf of Hourstons then presented the runners up trophies to Thorfinn A & the Cup & winners trophies to Rovers A.